The last time Dustin’s mother (second from right) and all her siblings were together, on Linda’s 60th birthday at the Grandover Resort in Greensboro, North Carolina, 27 November 2009. From left to right they are Rory, Bryan, Linda, Tania, and Carl. 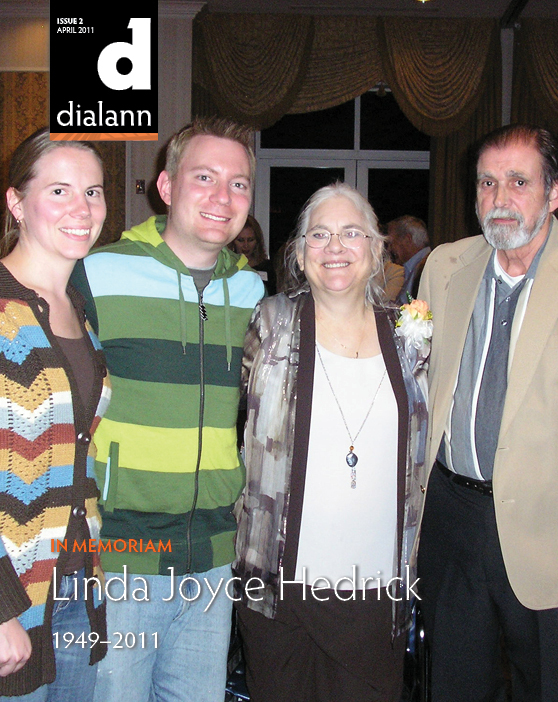 Mrs. Linda Joyce Hedrick, 61, died Saturday, 5 March 2011, at The Moses H. Cone Memorial Hospital. A memorial service will be held at 18.00, Wednesday, 9 March, at George Brothers Funeral Service Chapel with Reverend Patrick Fuller officiating. The family will receive friends immediately follow the service at the funeral home. Linda was born 27 November 1949 in Cumberland County to the late Carl Elridge Joyce, Sr., and Sylvia Nelson Joyce. She was in the nursing profession for many years, most recently with High Point Regional Hospital with more than 18 years of service. Linda was a devoted and loving wife, mother, grandmother, and sister. If you were her friend, you knew how much she cared for you and loved you and she was always there for you. Survivors include her husband of 40 years, Gary Hedrick, of the home; a son, Jamie Hedrick, and wife Brittani, of Greensboro; a daughter, Daria Hedrick Joyce, and husband Ron, of McLeansville; 5 grandchildren, Benjamin Hedrick, Brandon Hedrick, Molly Joyce, Allie Joyce, and Ethan Joyce; 3 brothers, Carl Joyce, Jr., and wife Cindi, of Houston, Texas; Bryan Joyce and wife Kathy, also of Houston; Rory Joyce and wife Gina of Springfield, Missouri; and a sister, Tania Joyce Blue, and husband Randy, of Frederick, Maryland. In lieu of flowers, memorial contributions may be made to Hospice and Palliative Care of Greensboro, 2500 Summit Avenue, Greensboro, North Carolina 27405. The family would like to express a heartfelt “Thank You” to Hospice and Palliative Care and to Dr. James Kim and all of the caregivers during her stay at Wesley Long and Moses Cone hospitals. This is the edited text of the obituary that ran in the News & Record in Greensboro, North Carolina, on 7 March 2011.